Decorative and specialty concrete can offer durable, long-lasting options for projects of all kinds. 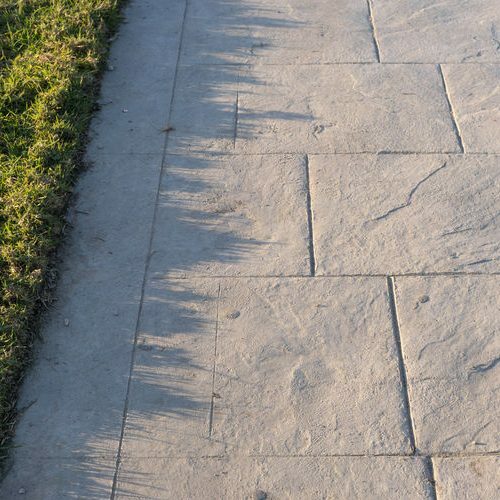 Whether you are building a concrete patio or repairing a concrete walkway, a decorative overlay can energize the appearance of any concrete structure. For more information on the benefits of decorative concrete in Waco and Temple, TX, call our experts today at 254-716-8685. While concrete stamping is done directly into an installation or pour, decorative concrete is formed by hand using a multitude of tools and can be tinted to match almost any style. Concrete remains separate from the overlay technique of decorative concrete. Decorative concrete thus becomes an ideal way to revive old and worn concrete. The overlay sheet can completely cover concrete to repair any divots or cracks, all while bringing a new decorative element. Microfinish: Used mainly for indoor purposes, this style can rid your newly exposed cement floors of tack strip marks, marker, and other inconsistencies we find when tearing up old floors. Use this finish to seal and refurbish your concrete before adding another overlay such as acid stain or heavy gloss. Acid Stained: This style provides an acid-washed look between two tints of the same base. This look creates depth and dimension and can be quickly applied to large areas. Heavy Gloss and Seal: Typically, this style of decorative concrete is used for countertops or other indoor concrete structures that need ultimate protection and seal. This finish can be wiped and cleaned daily and can undergo bangs, scrubbing, and cleaners. Trowel Down: As one of the most cost-efficient overlay options, this technique uses a hand trowel to form a lifted texture onto the concrete. Trowel jobs can be made to resemble stone and can cover unsightly seams and joints. For decorative concrete for your Waco and Temple, TX home or business, please call us to set up an appointment. Our professionals work with you from the beginning evaluation through the last inspection to ensure that you end up with the finished product you’re looking for. We assess your project and offer realistic solutions for every budget and style. Our team will discuss product and material information like cost and performance, along with details such as installation time and maintenance level so you aren’t left with hidden surprises. Our technicians will apply your overlay and form it to the exact look and texture you desire, and provide a finishing seal so peeling and fading are never a problem. Whether you are creating a whole new look for your home or refurbishing an old concrete structure, specialty concrete could be ideal for you. Call our experts at 254-716-8685 to find out more about decorative concrete in Waco and Temple, TX, or to schedule your evaluation. Updated on March 21, 2019 at 11:23 am by eSquared Asphalt Maintenance.